As more EV's arrive, what's the future for gas-powered engines? A tiny Swiss company (and others) hope to capture large quantities of CO2 from our air and help reduce the likelihood of catastrophic climate change - very long. Should you buy a hydrogen car? Answer these simple questions first. Can the world produce enought cobalt for EV batteries? Does Bell's eVTOL patent point to a coming patent war in new electric air? Link to ultra high-speed ground transportation study, CH2Mhill did for Washington DOT, Feb. 2018, 93 pp. Is geofencing the answer to cities electric scooter challenges ? Update from the Swedish General Transportation System Foundation. Can Waymo's self-driving cars help fix phoenix's public transit? We were told their would be Pod Cars - what happened? FTA's Strategic Transit Automation Research Plan, 262 pp. The smart transportation dispatch from Carnegie Mellon Univ. New video from Sky Tran, 2.4 minutes, quite different from previous videos. Is Autonomous transit ever going to be a reality? Trump's infrastructure plan is out and controversy is rampant! AXIOS scoop: Read the draft White House infrastructure plan (see part II). Uber, the "metropocalypse", and inequality in D.C.
Will autonomous vehices be able to handle all diriving conditions? How could AI help to alleviate major traffic congestion problems? Ban the bike from cities? - have cities made a big mistake promoting cycling? Taxi Pods may come to Bengaluru faster than BBMP can fix the potholes? PodCarCity Conference Newsletter, #3, Las Vegas, November 8-10, includes full program info, 10 pp. What kind of collaboration does there need to be between operators, authorities and 3rd parties to ensure MaaS becomes a widespread reality? U of TExas_Austin_PRT_Study now available for your review_ 118 pp. Link to Transitx Handbook with details for those interested in the specific attributes of the technology - 27 pp. Will Donald Trump expose america's great MASS TRANSIT hoax? The Great Train Robbery - discussion of the future funding and future of conventional transit, 44 pp. Automation and smart cities: are expectations realistic? : 2getthere white paper, 7 pp. The death of diesel: has the one time wonder fuel become the new asbestos? Video: World's first all electric VTOL Jer Tested - are flying cars here? Pod Taxi back on track, BBMP in India, issues a global tender, deadline for bids is June 1. Practices for evaluating the economic impacts and benefits of transit, 85 pp. The Last Mile, connecting workers to employment locations that conventional bus/rail transit doesn't serve. Moyers and Company: A better way to fund infrastructure? Why will self-driving cars fail? 2016 Republican Platform includes their intentions to phase out Federal transit programs and end Federal support for California's high speed rail boondoggle - see page 5. 2getthere press release: Delivering the first autonomous vehicle on public roads without a steward - scroll down to 1st on public road for the link. West Coast Rail Conference, LA, Feb 28-Mar 2. New Alliance for Transportation Innovation launched in Washington, D.C. Huge Federal Panel asks today: Why Waymo? Moovel, now located in POrtland, OR, is developing the Rid Tap app for analyzing various ways to get from A to B in your city. Link to City Mobile 2 booklet, EU Cities Demonstrating Automated Road Passenger Transport: Experiences and Recommendations, 52 pp. New book, entitled Automated Transit, Planning, Operations and Applications, by Rongfang Liu, at major bookstores - here is a link to the Table of Contents - three operational PRT systems are included. University of Michigan may test new kind of on-demand transit system called "hub and shuttle"
Driverless Cars Ahead: Ontario, Canada, Must Prepare for Vehicle Automation, 76 pp. Issue Brief: Transporting Masses in Urban India: Policy and Fact Disconnect, 12 pp., by Anupam Vibuti. PRT shuttle link proposed for Glasgow airport, decision due in December, 4 minute ride from rail station. Uber and Lyft to provide personal rapid transit services? China builds elevated bus (straddles cars that drive under it) and initiates a demonstration facility - click here for a link to the Chinese company that is making the straddle bus. Transport System Catapult Report: Mobility as a Service (MaaS), 52 pp. Ex. Summary: A New Way Forward: Envisioning a Transportation System without Carbon Pollution - Frontier Group report, 116 pp. Mobility 2050: A Vision for Transportation Intrastructure, report prepared for the Association of Equipment Manufacturers, May, 2016, 168 pp, see Ex. Summary and Table of Contents for guidance. Press release: SkyTran update - includes limited details on demonstration project in Tel Aviv and contact info. Why is Germany's largest railway interested in driverless cars for providing first/last mile service? 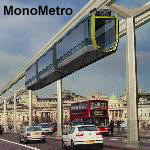 Ultimate PRT concept, includes design for lowering/raising vehicles to reduce number of stations required. Conference announcement: 2016 Energy Efficiency Global Forum, May 11-12, Washington, D.C. Final Conference Program: Innovation in a Rapidly Urbanizing World, Automated People Movers and Automated Transit Systems, Toronto, April 17-21. Link to National League of Cities report: City of the Future, Technology and Mobility, 36 pp. An analysis of why transit ridership is down when population growth is up, in Santa Clara, California, 49 pp. US DOT (FHWA): Notice of Funding Opportunity; Advanced Transportation and Congestion Management Technologies Deployment Initiative, $60 million/year, proposals due 06/03/2060, cost sharing required. News about William Alden's approach to improving in-airport mobility, from parking to the gate. Includes excellent video. End of Driving and What Happens to Transit? Link to some recent photos of the PRT installation at WVU in Morgantown, WV. Will Masdar become the world's first green-ghost town? Link to a description of a three-phase upgrade project for the Morgantown WVU PRT - at an estimated cost of $120-$130 million. Could Computer-Controlled Pods Alleviate our Choked City Streets? The race to create a hyperloop technology heats up - January 13, 2016 will be a milestone meeting. Transmodal capsule concept - has its day in the sun arrived? Must driverless cars be programmed to kill? City Mobile 2 Newsletter (EU) - lots of progress with automated vehicles, 8 pp. Future TRIP Act introduced in Congress by Ranking Democrat Lipinski of Illinois- wants significant reform of transportation capabilities in the USA. Seattle survey results: What would it take to get you out of your drive alone commute in your car? Link to ATRA's Lowson Award paper: PRT Application in Retrofitting Edge Cities - Macquarie Park Case Study in Australia, 17 pp. Powering trams with fuel cells - goodby to overhead wires? Call for Abstracts, ASCE Automated People Movers conference, Toronto, Canada, April 17-20, 2016, deadline June 3, 2015. US DOT: A Guide to Transportation Decisionmaking, updated 4/15, 24 pp. Bridj - another competitor for Uber, Lyft and Gett, (and PRT?) now in operation in Boston and Washington, D.C.
Aeromovel's very exceptional presentation provides considerable detail about this pneumatically propelled people mover, 53 pp. Link to video: HAMO - Toyota's New Urban Transport System, 3+ minutes. Egypt unveils plans to build new capital east of Cairo - an innovative transport opportunity? The Purpose, Function and Performance of Streetcar Transit in the Modern US City, 421 pp. Greenville (S. Carolina) County Economic Development Corporation, PRT Evaluation Study, 76 pp. Fact-finding tour: visit 8-10 driverless transit systems in S. Korea, June 5-9. Re-programming Mobility report, focus on impact of emerging digital technology on the future of urban transportation, 60 pp. Link to report: Re-Programming Mobility: The Digital Transformation of Transportation in the U.S.
Report: Automated Transit Networks, State of the Industry, Mineta Transportation Institute, 256 pages. Will driverless cars help us drive less? TRB Conference Summary, Sustainable Energy and Transportation, Strategies, Research and Data, November, 2012, 80 pp. NCHRP Report 570: Vol. 3, Expediting Future Technologies for Enhancing Transportation System Performance, RAND Transportation, Space and Technology Program, Santa Monica, CA. Is Electricity a Clean Transportation Energy Source? Launch expected summer of 2014 - Podaris, a toolkit for planning and designing Automated Transport Networks (ATNs), from the U.K.
Link to updated ModuTram Mexican GRT webpage - now includes 118 photos - can be translated into English. of the very popular Bubbles and Beams video at the end of the presentation. Automated Cars: A Smooth Ride Ahead? Buckminster Fuller Challenge - $100k prize available, proposals accepted starting February 14. Masdar blogging contest - Smart Cities and Sustainable Development - win a trip to Masdar with your entry. Updated YouTube video for the PRTproject concept now available - street level PRT concept that runs on rails with electric propulsion. Link to a critique of the Portland Streetcar System, by John A. Charles, Jr.
Conference announcement: Transforming Transportation, Washington, D.C. at the World Bank, January 16-17, 2014 - focus on business investments in sustainable transport. 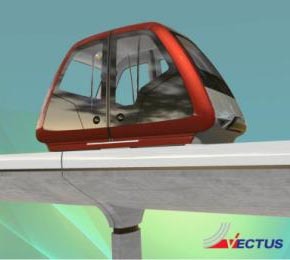 Link to TEV concept website - features autonomous dualmode vehicles on an elevated guideway for high capacity, high speed travel within and between cities. Downloadable 71-page booklet with considerable detail on all aspects of this concept is also available, in English and Chinese (see the bottom of the main website page). 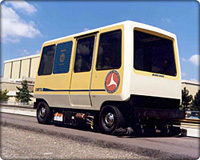 TEV = Tracked Electric Vehicle. Review of presentations at the recent APM conference in Phoenix - quite a lot of interesting material, especially about the Vectus application in S. Korea, by Will Ackel - currently, see the third item in this blog. 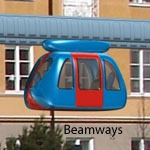 Doppelmayr ropeway carries autos on a suspended platform - YouTube video shows how it works. Every new car connected to the web by 2014? Link to new JPods video - funds available, ready to build theme. Presentation by Prof. A. Kornhauser (Princeton Univ.) on ITS, including PRT and Automated Highways (robotaxis). JPods and UK-based Equity Capital Ltd sign a letter of intent to build a large scale PRT system to help ease congestion in the Atlanta, GA region. Link to a development study of a pneumatic path-guided transportation system, called TubeWay, from Germany, English available. Link to the Executive Summary of the Aerospace Corporation's ATN report to the City of San José, 4 pp. Aerospace Corporation's report to the San Jose ATN study released - 421 pages. Executive Summary a good place to begin a review. Expanded information source for the 3G Roadway concept, including a copy of a book by Roger Davidheiser. Auto Shuttle dualmode concept wins competition sponsored by Bombardier for new urban mobility ideas. 19th ITS World Congress, Preview, Vienna, 22-26 October, 2012 (20 pp). 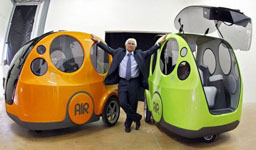 Link to article about the new Vectus PRT vehicle design by Pininfarina of Italy. Information about the process of certifying an innovative technology prior to opening it to the public. Elways - a Swedish electrified roadway concept - dualmode capability - funds for test track in Sweden have been obtained. ULTra PRT officially opened to the public at Heathrow Airport in the U.K.
Link to Fontinalis Partners website - venture capital firm focused on innovations in transportation, based in Detroit. MI. Link to new, compact description of current Personal Rapid Transit system attributes, prepared by ATRA Industry Group, 2 pp, illustrated. Link to a paper titled Modelling and Simulation of a PRT Network, by Castangia and Guala, 2011, 13 pp. Link to report from the MIT Energy Initiative's Symposium on Electrification of the Transportation System, April, 2010, 156 pp. Position Paper: Urban Mass Transit Administration's Program of Development and Deployment of Automated Guideway Transit, by J.E. Anderson, June 1979, 25 pp. An Invitation to a New Transportation Mode, by Tyler Folsom, 8 pp. Ridership Effects of PRT with Mass Transit, by Ingmar Andréasson, 16 pp. Link to new website for Freedom Transit - a dualmode concept for passenger and freight travel on electrified guideways. Additional details are provided in a 1 page WhyFT? statement and a 30 page paper. Link to the long range plan for the PRT system at West Virginia University in Morgantown (401 pp., takes a while to download). Passenger Terminal Expo 2011, March 29-31, Copenhagen, Denmark (programme includes a session entitled PRT for Airports and Cities with 14 presentations, March 30th (billed as a World Class Airport Conference). Link to Guidebook for Planning and Implementing Automated Peoplemovers at Airports, 229 pp. Link to a new brochure for the General Transport System Foundation in Sweden, 12 pp. Also, see the Bubbles and Beams video that is very similar to the GTS concept. Link to summary of the Modern Mobility conference held in Kansas City, Kansas - focus was on a PRT study. Link to paper entitled "Development and Evaluation of Traffic Management Strategies for PRT", by Pengjun Zheng, David Jeffrey and Mike McDonald, U of Southhampton, U.K. The Transport Research Knowledge Centre (TRKC) is a free database featuring up-to-date information on European transport research activities. It enables policy makers, researchers and other stakeholders to access results of EU or nationally financed transport research in the European Research Area (ERA). Link to a report on the 2010 ATRA Technix meeting, held at the U of Maryland, by Stan Young. 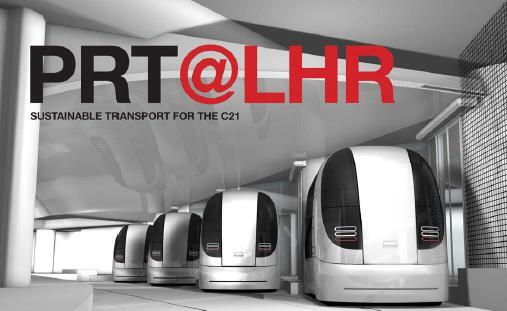 Includes an excellent BBC video that features the ULtra PRT project at Heathrow airport. Link to Strategic Research Directions, Priorities and Performance Metrics for Implementing Personalized Transit in Urban Areas, submitted on behalf of the Advanced Transit Association to the Research and Innovative Technology Administration of the US Department of Transportation, 7 pp. Link to PRT brochure from Winona, Minnesota - Winona is Ready! New blog that's relevant to dualmode interests - initial entry describes ITS-Park, an automated parking concept. MIT weekly transportation seminar underway, includes overview video presentation by Associate Dean Barnhart. Link to conference announcement: Transportation Summit 2009, Portland, OR, November 4-6. Link to new website by group interested in encouraging PRT in Austin, TX. New book information: Automated Transport Systems for Sustainable Urban Mobility, by Tom Voge, August '09 (see Amazon.com for details, Paperback, $75. Conference announcement: 21st Annual Public Private Ventures in Transportation, Sept. 24-25 '09, Washington, D.C.
TRANSvisions: Final Report on Transport Scenarios with a 20 and 40 Year Horizon, March, 2009, 244 pp. Chinese video clip shows the new Beijing maglev prototype running on its Tangshan test track. An Intelligent Transportation Network System (ITNS): Rationale, Attributes, Status, Economics, Benefits and Courses of Study for Engineers and Planners, by J. Edward Anderson, 35 pp. Link to paper about implementation the PRT plan for the Masdar eco-city: Introducing PRT to the Sustainable City, by Lohmann and Guala - a very extensive description of the plan, 15 pp. FTA report on low speed maglev research program - focused on lessons learned, March, 2009, 47 pp. Major update of ULTra PRT website: information about Heathrow airport project, proposals in San Jose, Santa Cruz and Alameda Point, implementation customization, details on vehicles, guideway, stations, control, capacity, environmental benefits, safety certification, solar, ATS staff, partners and history. Three new marketing presentations from Megarail: Low carbon alternative to traditional Texas turnpikes and Commuter Rail proposal for the Dallas-Ft. Worth region (applicable to other large metropolitan regions), Near-term I-25 & I-70 Mountain Corridor Solution (Colorado). Link to a collection of recent ULTra PRT pictures at Heathrow Airport in the U.K.
New website for PRT International launched - J. Edward Anderson is Managing Director. What happened at the PodCar conference in Ithaca, NY, September, 2008? Table of Contents for the Daventry PRT Scoping Study, and link to the entire document, 160+ pp. 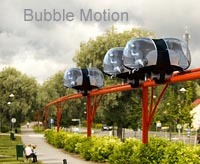 Link to Metrail monorail website - low cost monorail system. Link to pictures of Rotem's Daejeon maglev monorail 1-km demo site, in Korea. 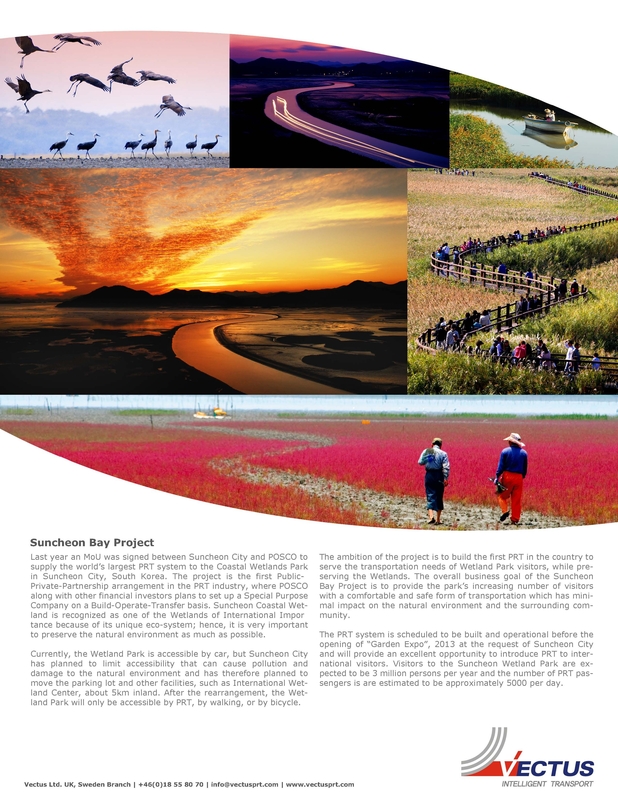 Inchon International Airport project being planned for 2012. 15th ITS World Congress on Intelligent Transportation Systems, New York City, November 16-20, 2008: ITS Connections: Saving Time, Saving Lives: Conference Program details, 80 pages. Technical sessions and demonstrations planned. These latter two pages also provide CEETI's definition of Dual Mode, a link to a video that illustrates one type of dual mode system and a link to descriptions of a wide variety of other systems currently being developed around the world. (TACV) for 60 passengers with a speed of 150 mph. Links to two excellent student project reports; one deals with the design of RUF junctions, the other deals with the design of a RUF route. Both are very impressive examples of what talented and motivated students with good direction can do. Announcement: Transportation Research Board, Annual Meeting, January 13-17, Washington, D.C.
CargoRail Port Operating Plan presentation for Ports of Long Beach and Los Angeles assessment, 9/2007, 10 pp. includes details from San Diego automated vehicle technologies at Demo '97. Customer Response to a Dual Mode Personal Rapid Transit System, MBA Thesis by Yonas Jongkind, Simon Fraser University, 2006, 74 pp. PRT consulting firm launches new website, focused on PRT applications in So. California. Toy maglev train video on YouTube - in German, high temperature superconductor, simple device, absolutely amazing. S.A.T project features small vehicles that can move horizontally, vertically and on a sloped guideway. The State of Urban Transportation, by J. Edward Anderson (written in 1970 but the problems are still the same, only much worse). JPods PRT signs agreement with Swiss company to commercialize its automated transit concept in Germany, Switzerland and Austria.